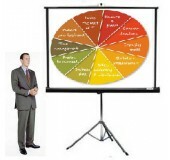 For presentations up to 150 people, tripod projection screen rentals are an affordable, portable and easy-to-use option. 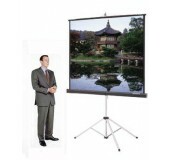 This portable tripod screen rental is ideal for Powerpoint or video projection for up to 150 people. Indoor use only. 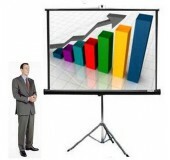 Rent this tripod screen for Powerpoint or video projection for up to 50 people. Indoor use only.